EarSonics SM1 review | What Hi-Fi? There are three main schools of thought when it comes to earphones. Use a bud-type speaker that sits outside the ear canal (think original Apple earphones); use silicon tips that sit just inside it; or go the whole hog, call them ‘in-ear monitors’ and use foam or custom-moulded tips that burrow (or so it feels) pretty far into your head. French company EarSonics has opted for the latter with its SM1s. They’re decidedly non-fancy-looking – with no inline mic or three-button remote, a basic black finish (with a braided cable for tangle-resistance) and not a jot of brushed or knurled metal to be seen. There isn’t even a coloured logo on them. A plus-point is the detachable cables – if they get damaged but the enclosures are still fine, you can replace them without needing to fork out for a whole new set of earphones. In the zippered carry-pouch you get two pairs of flanged silicon tips and two pairs of foam ones, plus a little cleaning brush. The SM1s use an over-ear design: the manual recommends you pass the cable up your back, bend the plastic-and-wire hooks over your lugs to hold them in place, and then slide the plastic sleeve up the two cables behind your head to lock it all in. It’s a comfortable, secure arrangement, and has the added bonus of transmitting less cable noise when you’re out and about. The enclosures also sit completely flush to your ears, which is a nice touch. One motorbike-riding member of the team said they could be ideal for long motorway stints, doubling as isolating earplugs and not getting pulled out when putting on a crash-helmet. Third Eye Blind’s Semi-Charmed Life is a good test of dynamics, bass composure and energy, so that’s where we begin. And the SM1s immediately show themselves to have an easygoing nature. 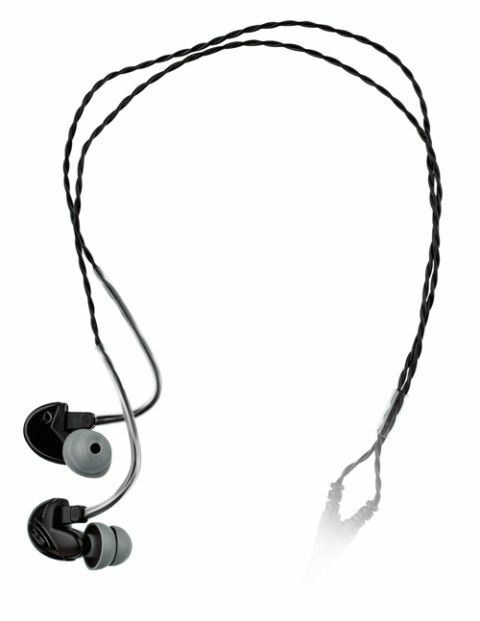 Many earphones around this price – especially in-ear monitors aimed at the pro end of the market – can sound clinical and functional, but the EarSonics strike a decent balance between analysis and exuberance. They won’t rattle the fillings out of your teeth with their bass, but neither will they make your nosehairs fizz with their treble. It’s the midrange that’s the star here: it’s detailed, dynamic and natural sounding, with vocals in particular sounding nuanced and emotive. However, we do have a gripe – and it’s quite a big one. For all their understated, ear-friendly sound, overall they just sound a little… flat. We can’t help but wish for more entertainment here; more life. It’s all just that little bit too controlled and closed-in around the edges – fine if you’re monitoring on-stage, perhaps, but not when you want to bop along to your favourite songs. If they had more space to breathe, especially at the lower end of the frequency range, the SM1s would be in with a shout of five stars. As it is, though, it’s a slightly disappointing three.